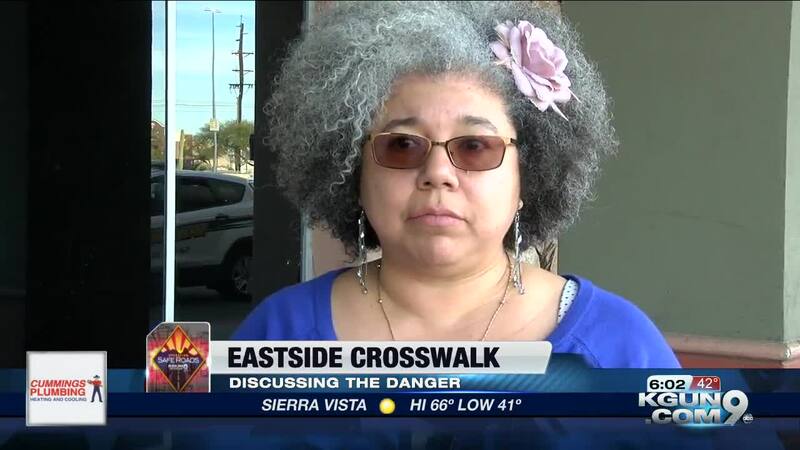 TUCSON, Ariz. - Residents and business owners in one neighborhood on the eastside are expressing their concern over what they believe is a dangerous crosswalk. On Tuesday Jan 15, a teenage girl was crossing Pima Street near Wilmot Road when she was hit by a car. Police said it seemed the girl was in the crosswalk at the time of the incident. She was taken to a hospital where police said she was suffering from life-threatning injuries. Tania Diaz, a nearby resident, told KGUN9 she's lived in the area for a while and has always been overly cautious when it came to crossing that crosswalk. "It's not easy to cross the street because the cars are coming. Where you have to stand at to cross the street, it's a little bit further back from the street so unless you get into the street to say 'hey in trying to come through' the other drivers aren't going to see you. But then as a driver going up and down that street you don't always see the pedestrian standing in the sidewalk," Diaz said. She added she's had so many issues trying to get across that specific crosswalk there have been times she avoids it all together and takes the few extra minutes to cross at the Pima Street and Wilmot Road intersection. Jonathan Landeen is the owner and head chef at Jonathan's Cork which is located at the nearby intersection. He's been in business for more than 25 years and said when he drives down Pima Street has always as alert as possible because he knows the crosswalk is not too far from the intersection. Landeen said he recommends drivers slow down and stay as alert as possible when they drive onto Pima Street from WIlmot Road and added he recommends pedestrians just walk to the intersection. "I don't know that there is a simple remedy. If you want to put a crosswalk with a stop light that we have on speedway, that would be the safest. That doesn't mean that people are going to use them," said Landeen.